While France's Olivier Backes and crew Matthieu Vandame didn't get off to a great start on the penultimate day of the Globaltech Formula 18 World Championship, they have kept a firm grip on their lead with only three races remaining. 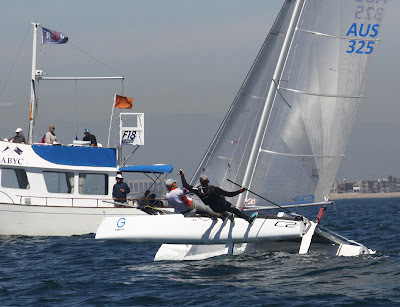 With a solid lead over a flock of competitors in the mid-40s on net points, they only need to post decent results in Saturday's first two races and cash in their second discard by sitting out the last race of the regatta hosted by the Alamitos Bay Yacht Club. 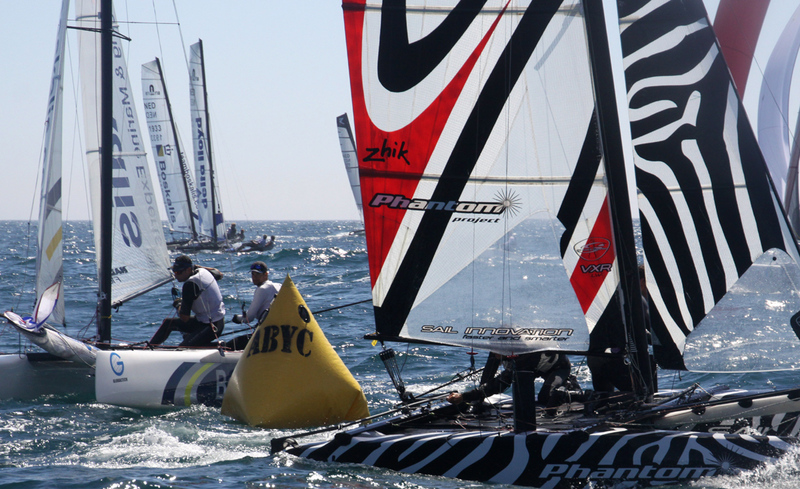 Not bad after taking a black flag disqualification for jumping the start line in Friday's first race, that was won by Australia's Easy Tiger Racing Team of Rod Waterhouse and Chris Way who are in 27th place. The men from Marseille finished the day with a first and third among the 60 boats in the Gold fleet. The official 61st place became their second discard following their previous worst finish of a sixth on the opening day on Tuesday, a result they can probably now afford to count by passing on the last race on Saturday. Backes said he didn't know they had blown the start in the first race until he crossed the finish line. 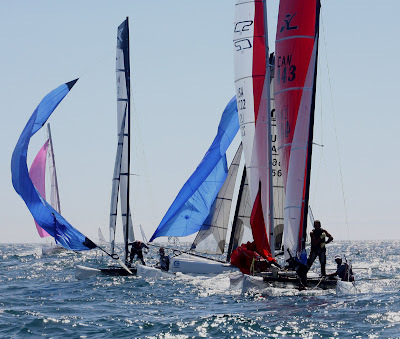 "We were in a group of boats and couldn't really see the line. If we sail two good races we can head for home," Backes said, smiling. "It's a comfortable position." 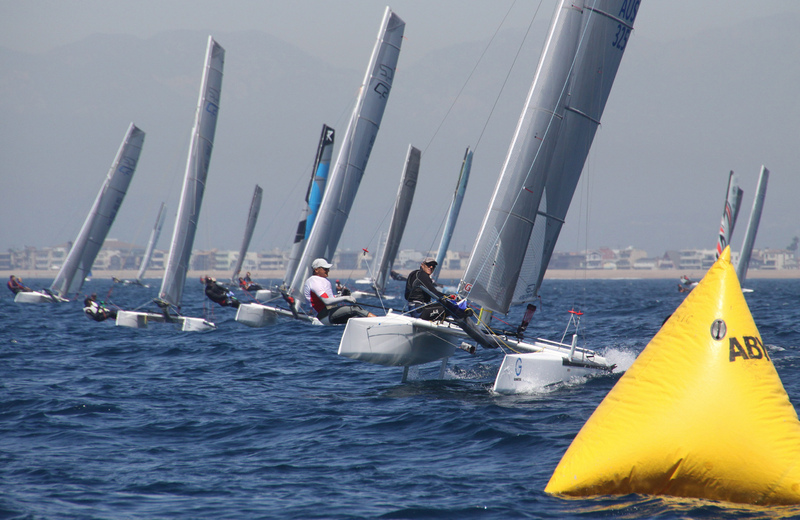 Oscar Zeekant/Karel Begemann and Mischa Heemserk/Bastiaan Tentij of The Netherlands were next in net points with 44 and 45, respectively, followed by first-day leaders Billy Besson/Jeremie Laguarrigeu of Switzerland on 47. 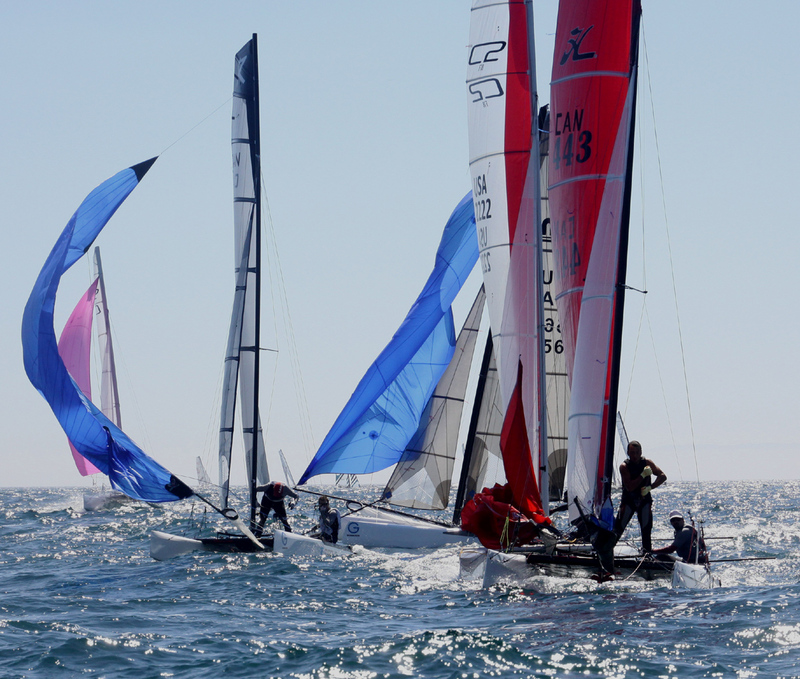 Gunnar Larsen/Gerhard van Geest on 49 are the third Dutch team in the top five.Defending champion Darren Bundock and crew Jeroen can Leeuwen are sixth on 58 points after two strong days during the week but have slipped thanks to a ninth, 28th and an eighth on Friday. "Not a good day for us," Bundock said. 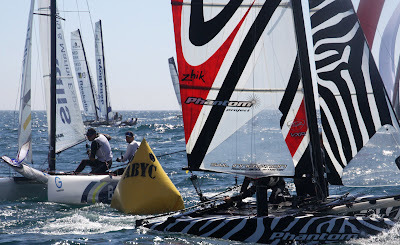 "We thought there was going to be more pressure on the left, so we started at the pin [left hand end of the line] and the boat was going really fast. But it was a bad decision." With a wind-killing high-pressure heat wave settling over Southern California, the 118 boats in Gold and Silver fleets virtually drifted the two miles out to the start line in about three knots of wind. The familiar southwesterly sea breeze arrived to ruffle the glassy seas.. 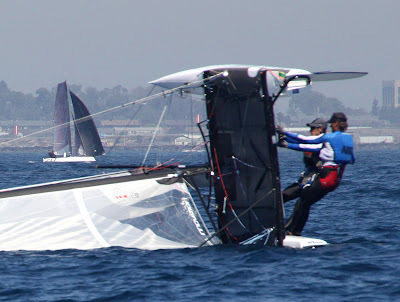 It built to seven knots for the first race and peaked at 15 knots before dropping back to seven knots by the end of the day. Waterhouse and Way were ecstatic with their win. Their next best finish was a ninth on Wednesday, so the victory Friday made their week. "We're not a very quick boat," Waterhouse said. "The young guys usually get us so we're very pleased. 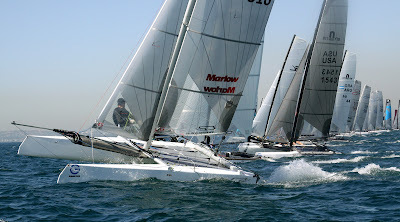 We get together for major F18 regattas like this event." Waterhouse, 55, has enjoyed much success as an ocean racer and is the current Hobie Cat catamaran Masters champion. 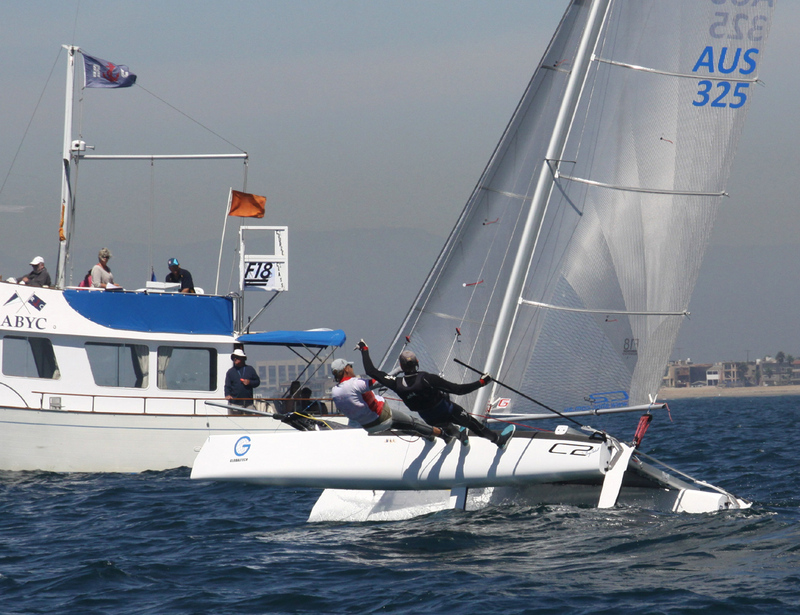 Way races on a slew of monohulls including a Farr 40, Melges 32, Platu 25 and Sydney 38. 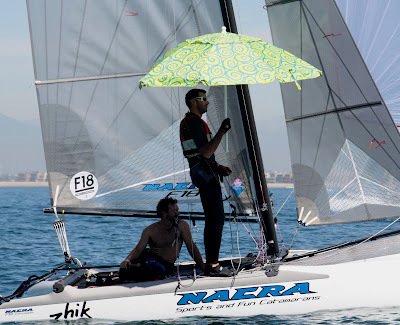 In May this year he won the Platu 25 Coronation Cup at The Top Of the Gulf regatta in Thailand with Tom Spithill, brother of America's Cup winning helmsman James. 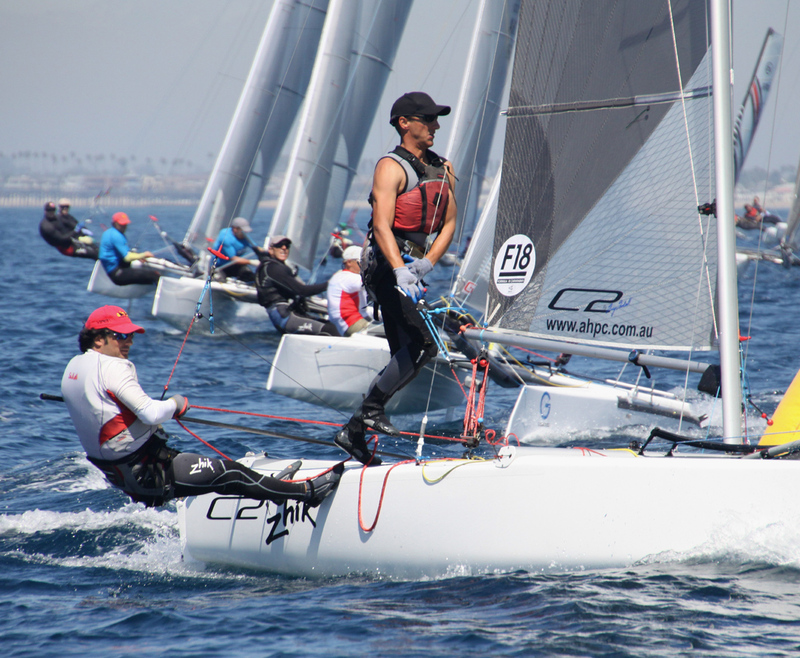 Florida sailors Taylor Reiss, 19, and Matthew Whitehead, 17, are the top USA team in 12th place, followed closely by Michael Easton and Tripp Burd.